The top placed Western Bulldogs held on to win by 8 points over the bottom placed Collingwood, after the Pies came at the Dogs late in the final quarter at Moe. It was a very high intensity aggressive game of football, which saw Steph Chiocci and Libby Birch reported in the first half of the match. There was heaps of pushing and shoving in this match in the first two quarters. The Pies came at the Dogs late in the final quarter, but the Dogs held on to win by 8 points over the bottom placed Pies. The match started as a physical encounter between the Pies and Dogs. However halfway through the first quarter the Dogs begun to get on top in the contest over the Pies. Steph Chiocci was reported early in the first term with high contact, as she did a hip and shoulder to Libby Birch’s head and Birch came to the bench holding a towel to the side of her head. The Dogs scored the first goal of the match and Ellie Blackburn who kicked long to goal set up this goal and it dribbled towards goal to Bonnie Toogood who crumbed the football and nailed through the goal. Moana Hope kicked it short to Meg Hutchins who was given a 50m penalty and from the goal square she scored the goal for the Pies. Aisling Utri slotted through a nice goal of a snap kick for the Dogs second goal of the match. Lauren Tesoreiro does not give the football back to Aasta O’Connor, so O’Connor was awarded with a 50m penalty. So she lined up from 40m out and her goal splits the middle as she booted through the goal nicely. The Dogs led by 16 points over the Pies at quarter time. This match continued to be frenetic in the second quarter and heaps of free kicks were awarded in this term as a result. Caitlyn Edwards has been awarded a free kick and she slotted through the goal truly between the big sticks from about 25m out for a much-needed goal for the Pies. Emma Kearney was given a free kick from about 50m out, so she kicked the football long towards goal and the football fell to ground metres from goal and Brooke Lochland soccer kicked the football of the ground for a goal. In the second quarter, the umpire reported Birch after high contact on Moana Hope. Amelia Barden was given a free kick after she was dealt with high by Hannah Scott. Barden responded with a quick goal for the Pies from about 20m out. Late in the second term, Brittany Bonnici swung Kearney into the fence and they pushed and shoved each other. As a result the Dogs are given a 50m penalty. At the main break the Pies were down by 12 points in a fiery clash. At the start of the third stanza the Dogs were able to strike with the first goal. This goal from the Dogs came after they won the clearance and Kearney kicked the football long inside 50 and Lochland marked with a strong contested mark and she slotted through her second goal of the match. Edwards was given a free kick and she nailed through the goal from about 20m out. She scored the quick reply for the Pies to become the first multiple goal scorer in this match. 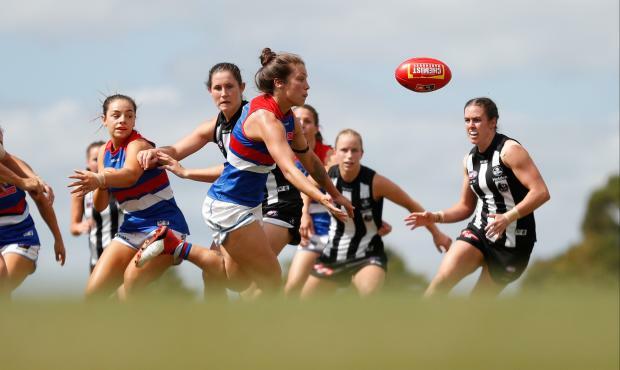 The Pies made a mess of the football in their defensive 50, as Toogood intercepted a Pies kick and Toogood with great teamwork found Blackburn who she hand passed to. Blackburn kicked an easy goal from the goal square. This third quarter tight tussle from both teams but it was not as physical as the first half of the match. The Dogs had a 17-point advantage on the scoreboard over the Pies at three quarter time. The Pies controlled the early stages of the fourth quarter, but they were not able to capitalize on the scoreboard with goals for their effort. They only managed to kick two behinds. Nicole Callinan booted through the first goal of the last quarter from the goal square. Chloe Molloy went forward after she has played predominantly in the backline for the Pies late in the fourth quarter. As a result, Molloy took a strong mark inside 50 and she kicked the goal nicely between the big sticks from 35m out. Molloy scored her first ever goal in her AFLW career. Christina Bernardi kicked a timely goal for the Pies after she was able to break away clear towards goal and she kicked the goal from 35m out. The Dogs held on to win by 8 points in Moe after a late fight by the Pies who kicked the last two goals of the match. It was looking like the Pies were going to run over the top of the Dogs late in the match and cause another upset like they did up in Darwin against the Melbourne Football Club. Blackburn played a great captains game at Moe today, as she led from the front for the entire match and she finished the match with 17 disposals and one goal. It was a great captain's game played by Blackburn. After this match the Pies are well and truly out of the finals race and the Dogs are flag favourites. Reports: Chiocci (Collingwood) reported for high contact on Birch (Western Bulldogs) in the first quarter, Birch (Western Bulldogs reported for striking Hope (Collingwood) in the second quarter.